Beth Pritchett in Food Lifestyle on 28 February, 2018. 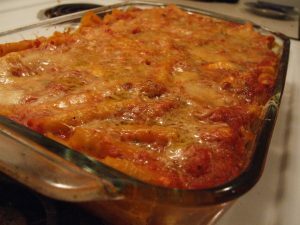 The pasta bake is a classic dish for me and my housemates. If you need something to last you a few days at the end of a week, when the budget it tight, it is the perfect meal. There are so many variations, and you can really use whatever you have in your cupboard/fridge. Plus it is cheap I have tried and tested many types, but this recipe is by far my favourite. Taste and make sure you are happy with the flavour – now would be the time to add any extra seasoning. If you are happy, then remove from the heat. ***Obviously chorizo isn’t an ingredient everyone has in their fridge, so you could add chicken, or just the bacon, or miss those ingredients out all together if you are veggie.